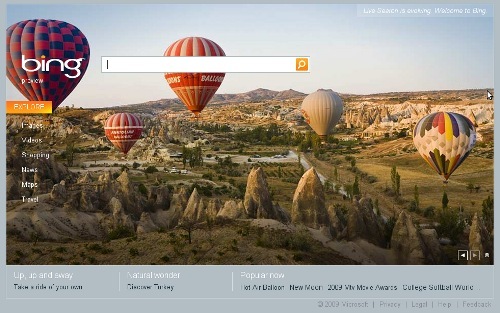 Bing, il motore di ricerca di Microsoft è online con una preview. Per poter vedere dall'Italia qualcosa che non sia un semplice clone di Google, è necessario impostare l'area geografica su "United States". Ho l'impressione che ci stiano lavorando in questo momento, o comunque che il sistema sia ancora sotto affinamento (come è naturale), le pubblicità cambiano formato mentre navigo, la ricerca di "Barack Obama" una volta mi ha restituito: impossibile trovare attività commerciali "Barack Obama" vicino a Savona, Liguria . Però alcune ricerche sembrano mostrare potenziale, ad esempio "Hotels New York" riporta nella barra di sinistra "Hotel Deals" che se cliccato presenta una bella maschera riassuntiva nella quale è possibile filtrare la ricerca secondo diversi paramentri come prezzo e categoria. Altri esperimenti "Live" sul mio twitter. redirected to a confirmation page on your site control. Hi there! This is my 1st comment here so I just wanted to givea quick shout out and tell you I truly enjoy reading through your blog posts.Can you recommend any other blogs/websites/forums that deal with the same subjects?Thank you! whoah this blog is wonderful i like reading your posts. Stay up the good work! You realize, lots of persons are looking round for this info, you can help them greatly. I truly do really like My Source so I have made a decision to share my favorite one particular with you, the foods is so delightful, hope you get pleasure from! shakes, make sure you visit us at Best Fruit Smoothies. Remove chicken from oil and set on paper towel-covered plate. great author. I will make sure to bookmark your blog and will come back someday. Great awesome issues here. I am very happy to look your post. Thanks a lot and i’m taking a look ahead to touch you. Will you please drop me a mail?